What kind of country are we in? FBI officials get to lie to the FISA court to obtain a warrant to spy on a presidential candidate-Donald Trump. The application for the warrant was based on a phony dossier and none of the FBI officials have been brought to justice? What happened to equal justice under the law? 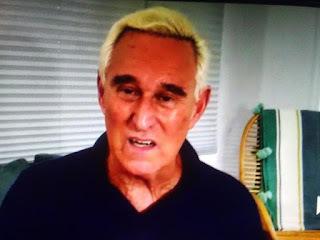 Roger Stone is accused of committing process crimes, meaning the alleged crimes occurred after the start of the investigation. Lying to the FBI is a felony. It's how the Feds entangled Martha Stewart and she ended up going to prison. Who was involved in that case? Former FBI Director, James Comey. It was Comey's FBI that allowed Hillary Clinton to interview for three hours. She was under investigation for breaking numerous federal laws. Matters much worse and of greater impact to the country than anything Roger Stone has allegedly done. Did the FBI show up at Hillary's door at the crack of down with 30 man FBI commando squad? No. They asked her to show up and she did. The FBI could've done the same for Roger Stone. They wanted a "show arrest" for the cameras. But, it's worse than that. Hillary was allowed to interview, no video, no court stenographer, no written transcript, Why? It appears to me and the American people can conclude that the FBI was making sure there was no evidence of Hillary Clinton lying to the FBI so she can skate. Everybody in that room needs to be indicted! This is a two-tier justice system and it needs to get fixed. Why should anyone have confidence in the FBI and the DOJ when outright crooks are running the agency? This is as bad as gets! And if it doesn't get fixed the Constitution allows for bloody revolution to fix it. Look it up because we're reaching that point as a country. And if the FBI lawbreakers, Hillary Clinton, James Comey and others are not brought to justice, we'll get there!